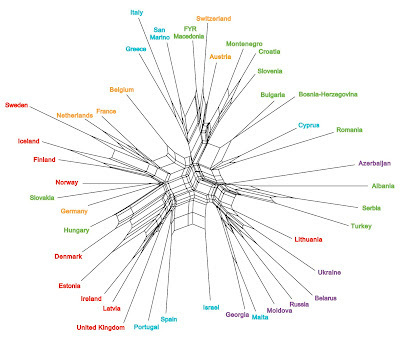 Some time ago I considered the Eurovision Song Contest for 2006, and provided a network analysis of the voting patterns among the countries. It is now time to consider the 2012 contest, especially since the local (ie. Swedish) contestant won. (I am not sure that I would have voted for this song, myself.) There are a number of interesting similarities and differences between the two years. The data analysis is the same as last time, using the Steinhaus dissimilarity (or Bray-Curtis similarity), so that "negative matches" do not create similarity due to which songs are not voted for (since we have no score for those songs), and using a NeighborNet analysis to display the phylogenetic network. The previous post can be consulted for a detailed description of the rationale, as well as for an introduction to the contest for the uninitiated. Countries that are closely connected in the network are similar to each other based on their voting patterns, and those that are further apart are progressively more different from each other. I have used the same country colour codes as last time: red represents the countries from Northern Europe and around the Baltic; green is for the countries from Central-Eastern Europe; orange is for the countries of Western Europe; blue is for the countries from Southern Europe and the Middle East; and purple is for the countries from the former Soviet Union, in Far Eastern Europe. The same strong geographical patterns in the voting patterns are present in 2012 as in 2006. Particularly noteworthy is the divide between Western+Northern Europe (on the left of the graph) and Eastern Europe (on the right). This is so despite the fact that the make-up of the competing countries is somewhat different between the two years. This is related to the recent success of songs from eastern Europe, in a contest that used to be completely dominated by western and northern Europe. 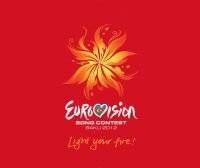 Former countries such as Yugoslavia and the U.S.S.R. that would have been represented by a single song that was voted for by very few countries, are now represented by many songs, with many extra countries to vote for them. There are more countries on the right part of the graph than on the left. Some of the "outlying" countries in the 2006 analysis (ie. not located with their geographical compatriots) are again outliers in 2012, notably Lithuania, Malta and Switzerland. This replicated pattern may bear looking into by sociologists. There are, not unexpectedly, some countries that are "outliers" in 2012 but not in 2006, such as Cyprus and Greece, and ones that were "outliers" in 2006 but not in 2012, such as Romania and the Ukraine. Interestingly, the other 2006 "outliers" did not compete in 2012 (Andorra, Armenia, Monaco and Poland). There are also countries represented in 2012 that did not compete in 2006, thus allowing some of the previous voting predictions to be tested. Intriguingly, some of these countries also have unexpected placements in the network: (i) Hungary and Slovakia, from Central-Eastern Europe, voted with the Northern Europe - Baltic countries; and (ii) Azerbaijan, from the former Soviet Union, voted with the Central-Eastern Europe countries. However, Italy and San Marino, from Southern Europe, did vote with at least one of their geographical compatriots. This set of comparisons suggests that it is possible that unusual voting patterns are associated with countries who compete in the contest only sporadically. That is, only regular participants vote in a predictable way. This hypothesis is testable by examining more years. The repeated presence of strong geographical patterns in the Eurovision voting behaviour has been noted by previous commentators (see the previous post for references). It would thus be of interest to see how well such patterns can be displayed by a phylogenetic network analysis of the combined data for several contests. This analysis would also examine the suggested inconsistent voting of countries who compete only sporadically.